Are You Ready To Raise Your Money Vibration With Law of Attraction? 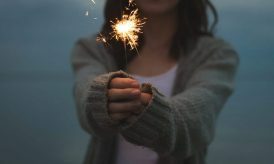 In other words, if you are able to establish a vibrational match with your desires, your chance of getting your desire manifested enhances dramatically. Therefore, when you are able to Raise Your Money Vibration with Law of Attraction, you are able to attract money into your life experience from expected and unexpected sources. In addition to that, developing your attracting capabilities with your beliefs, attitude towards money, your dominant conscious and unconscious thoughts about money and most importantly your vibrational frequency towards money. All these play a very important role in your life. However, a desperate desire is equally effective in delaying your money manifestation. When we need money very quickly and not aligned vibrationally with your desire, it actually blocks your energy and abundance could not flow easily and effortlessly. In our Raise Your Money Vibration Program, we consciously designed the program in such a way that it will help you feel positive about money and remove all your negative blocks about money so that you can attract money from all sources. This has been happening since the beginning of the program. 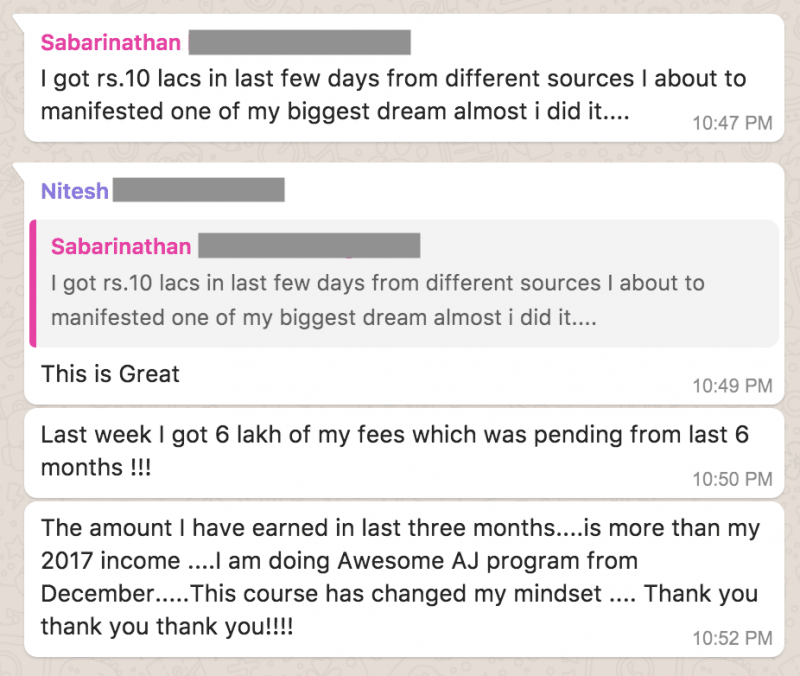 Here are some of the Money Manifestation Success Stories with screenshots from the program participants, who successfully attracted money from various sources. Raising Your Money Vibration and Attracting More Money into Your Life with Law of Attraction has never been so easy and effortless. Read the following six stories and get inspired. Nitesh’s strong belief in Law of Attraction and his positive mindset helped him to attract INR 6 Lakh which was pending from last six months. This doesn’t stop here, he manifested many things in due course of time. One of his big desires was earning more than his last year’s total income and he did in just three months this year. And it was all possible with his new business, high positive money vibration and Law of Attraction. Nitesh has been doing many of our Programs like Raise Your Money Vibration, Make Your 2018 Awesome and Transform Your Destiny to master these processes. Most importantly he is a very dedicated person and apply all tools and techniques passionately and love his work. He is a perfect combination of positive mindset, 100% faith, strong work ethics and passionate businessman. And now Success has become his constant companion. When Aash joined our program his intention was to attract big money. 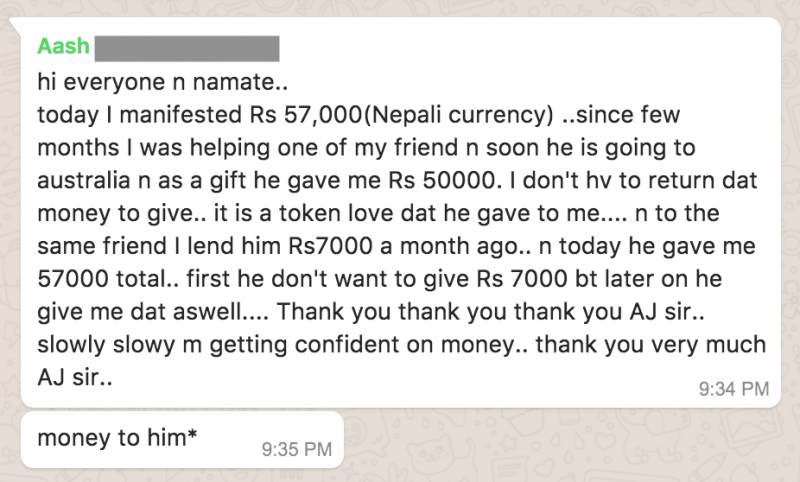 He manifested Rs 57,000(Nepali currency) from one of his friends. Aash lent Rs 7000 to a friend and his friend was not in a mood to return it. With his positive vibration not only his friend returned him what he lent but also gave an addition Rs 50000 as a token of love. This came as a surprise to Aash and also enhance his confidence in Law of Attraction and it’s practiced. Ankita Raised Her Money Vibration to such a level that Money Started flowing from multiple sources. Ankita received money from all corners when she set her intention right. She believed in the practices fully and attracted money and income from multiple sources within a few weeks’ time. She received her bonus, pending payment, a part-time job offer and a surprising bonus from her father. Isn’t that super awesome? Money flowing from all corners when you are vibrating and sending the right signal to the Universe. Law of Attraction Not Just Work For You But It Can Work Through Your Family Members As Well. 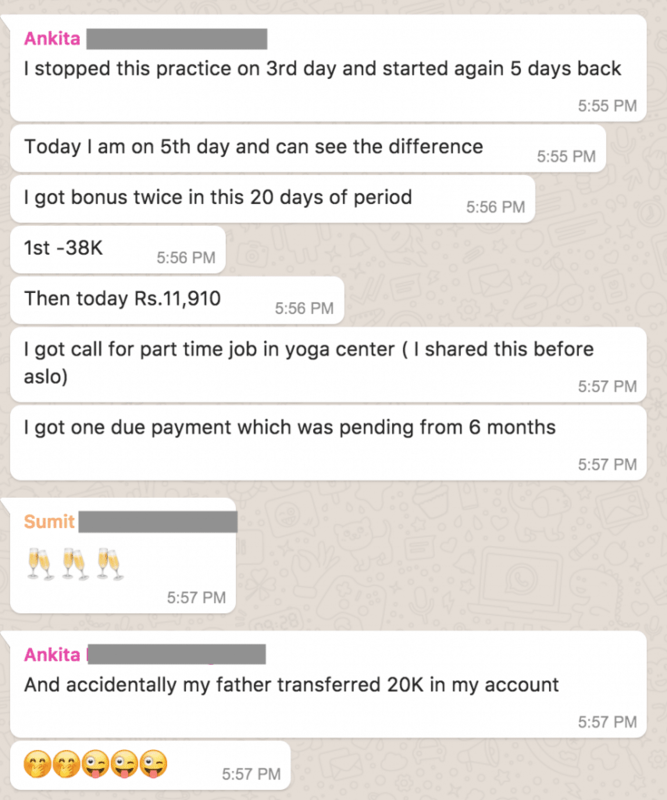 Pooja’s husband placed a guy in an MNC and got 4.3 lakhs as a closer amount. He is a US IT recruiter. Now they are are planning to start their own staffing firm. Thank you, Pooja for sharing this. We congratulate you and your husband on your money manifestation. When your spirit is high, your attracting capabilities enhanced automatically. And if you are not directly involved in earning then more money will come through your loved ones like your partner or family members. Remember money and wealth has no limitations. When you Raise your money vibration and stay in the receiving mode then it will find it’s way to you. Pooja’s Story is one of the best examples of manifesting Money through your loved ones. It’s the same story with Navneet too. She got all her allowance money pending for last 3 months. She had also rewarded for her efforts in generating some extra business in the form of insurance last financial year. All this possible when she followed the Raise Your Money Vibration Program religiously and implement it in her daily life both personally and professionally. The possibilities are endless. You can get all your pending payments and much more in just a span of 21 days to one month if you believe in yourself, the law of attraction and have positive money vibration. Alia has a very clear understanding that inner transformation is the key to outer manifestations. And that’s why during the program she focused more on cleansing her inner doubts and limiting beliefs because she knows that once it is done her life will be flooded with wealth, abundance, and prosperity. We are immensely happy with the magical inner transformation that Alia has witnessed. We always believe such inner transformation formed the foundation of a truly abundant life. 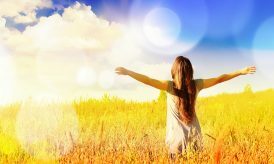 Are You Struggling with Negative Beliefs and Low Money Vibration? We came across many participants who are subconsciously having a lot of negative beliefs about money. This is the biggest reason of not able to attract big money. 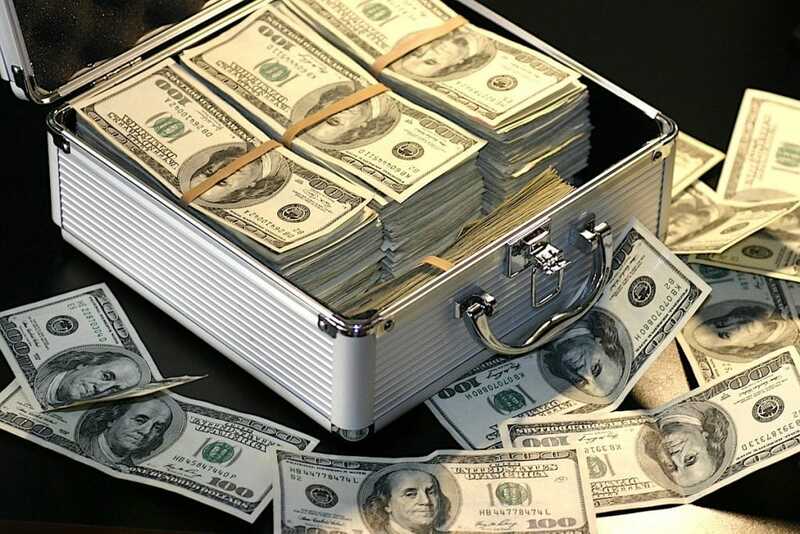 Though everyone loves money on the surface, when it comes to real manifestation, people fail because they have been carrying so many negative beliefs & emotions about money. And these negative money beliefs have developed over a period of time. These negative block not allowing yourself to create or have abundance in your life. You have to remove these negative money beliefs. 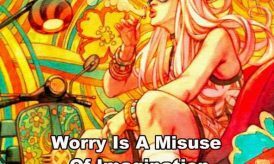 But you can’t achieve it by being too serious, one must have a playful and positive attitude toward money so that it would flow into your life easily and effortlessly. The Universe is full of abundance and there is plenty for everyone. 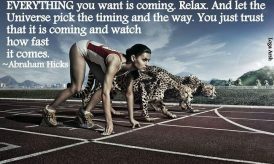 You have to set an intention and make yourself ready to receive it with the right mindset and higher vibration. Money is a form of energy, treat it like that, be ready to receive and accept that energy into your life. What you need to understand is your abundant life is not limited to your job or profession you are doing or it’s not about the money currently coming to you or to your family. The key to your abundant life is an extremely positive belief system for money, wealth and prosperity. Open yourself to receive it from wherever it’s coming. You will see new doors opening up. Money, wealth and prosperity coming from expected & unexpected sources. You start meeting people you have never met before. You start getting opportunities that you have never thought before. Your business sales and customer base started increasing. You start to get bonuses and unexpected raise at work. Your pending/blocked money gets released. People in your family also start attracting money. And so much more can happen in an unexpected way. 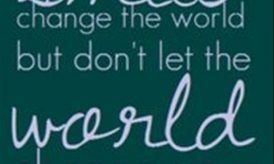 That’s why our Raise Your Money Vibration Program is so powerful. Remember it’s not just about those 21 Days, it’s about transforming your money beliefs forever. We congratulate all the above Awesome Tribe members for transforming their money beliefs, raising their money vibration and manifesting like magic. We will share more such inspiring stories about many of our members. Trust us this is just a tip of the iceberg. We wish you abundance and bliss. Raise Your Money Vibration and Attract Money in Abundance. Share this inspiring story/post on Facebook, LinkedIn & Twitter. I am trying to manifest a call from someone but not getting it. I am doing what you are saying. Hi Brother. I have lost everything. was successful in business. lost business,house and cash. Pray and fast all the time. NO BREAKTHROUGH AS YET. constructed and underconstruction premises, however lots of money blocks were created in my life. After joining AJ’s RYMV programme,all my money blocks started releasing and miracles started happening. I have till now started making whooping sales and started enjoying real money shower and I am thankful to the Universe for connecting me with Awesome AJ at the right time. Hi brother, believe in yourself and Universe. Keep working and praying. Everything will be alright.